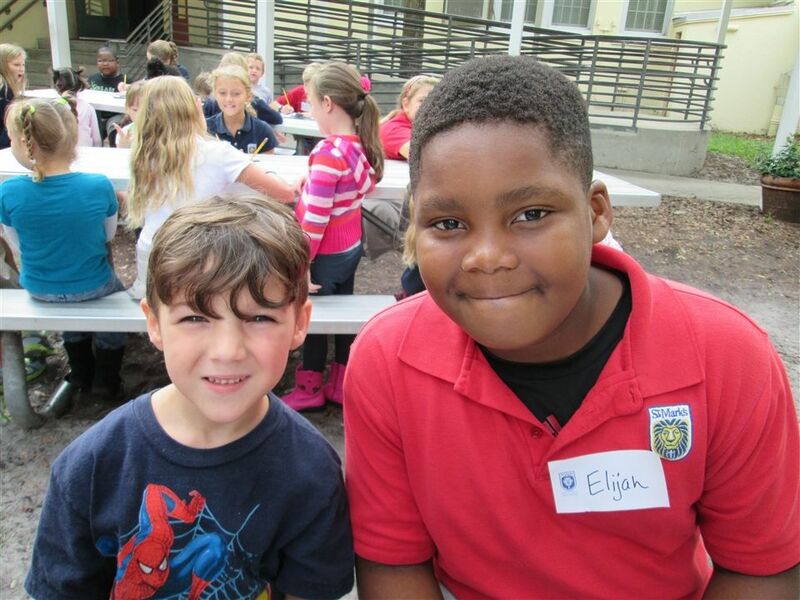 At St. Mark’s, service learning opportunities abound! Hands-on experiences in each grade level, Kindergarten through 6th grade, intentionally use service activities to engage our students, enhance curriculum, affirm character values, and build relationships in the community, locally and globally. Service learning experiences are appropriate to our students’ ages and developmental abilities, deepening their knowledge and connecting the St. Mark’s community to real-world issues and needs. 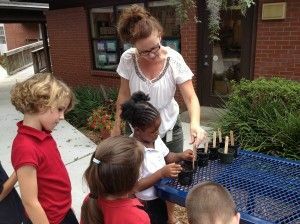 Kindergarteners study how fruits and vegetables grow, while learning valuable lessons about need and hunger. Living in Florida, many families have citrus fruit trees in their yard. December is when most of the fruit is ripe and ready to eat and these trees often produce more fruit than any family is able to consume. As a service project, kindergarteners held a school-wide citrus drive to collect the extra fruit. For three days, students and parent volunteers collected donations of “spare” fruit from the school’s families during morning carpool drop-off. The kindergarteners would then sort by type (oranges, lemons, grapefruits, kumquats, etc. ), and count and weigh the amount collected as a math lesson. The students proudly fill up a truck bed (last year they had 630 lbs (over 1,000 pieces)) to be delivered to Second Harvest Food Bank where it is distributed to families in North Florida who are food insecure. First graders hold a shoe drive each year. As the collection grows, the students sort, match, and count the donations. Last year, a total of 945 pairs of shoes were collected! The shoes are then donated to Soles4Souls and distributed all over the world. Some of the recipients of last year's collection were children at a school in Haiti. The first graders learned about Haiti, its culture, its challenges and its people - making the Service tangible to our 1st graders. Our children even wrote letters to Soles4Souls CEO, Buddy Teaster, who wrote them back! Because our own students love to read and have lots of access to books, we will be collecting and donating gently used books to share with others who do not have many to read. We look forward to making a personal connection with people in our community by sending a personal note and delivering the books in person. Each year, third graders collect items to donate to the Jacksonville Humane Society. They collect and sort t-shirts, towels, toys, leashes, and make toys out of old socks. A representative from the Humane Society visits each year to teach the third graders about the needs of homeless animals. In a cross-curricular approach, fourth grade explores the challenges of our St. John’s River. They read the book, Trouble on the St. Johns River, by Jane Wood. In partnership with the St. Johns Riverkeeper organization, they learn what makes a healthy river and what hurts our river. Following guidence, they take inventory of their own homes, garages, and lawn services to determine what they may be putting on their lawn that will find it’s way into the ground water and or storm run off and eventually in our river. 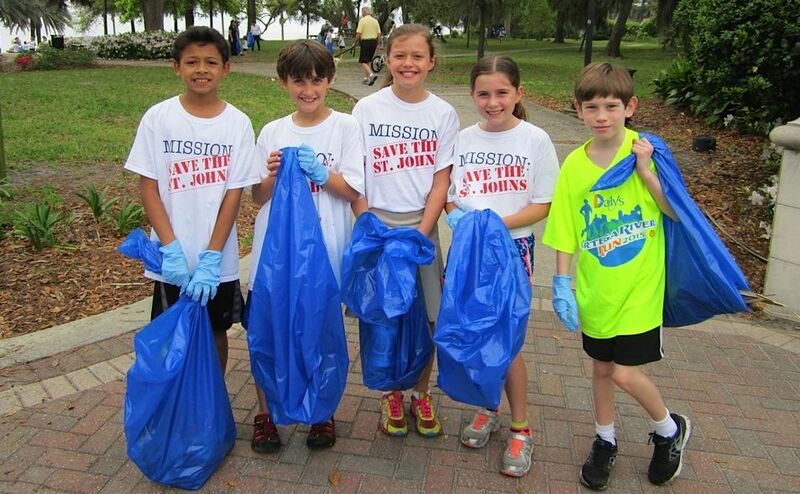 This service learning culminated in a school wide St. Mark’s Day School River Clean Up Day. 5th grade’s service is focused on literacy, writing, and mentoring. We walk down to Ortega Elementary nine times during the year to help younger elementary students with reading. This relationship with Ortega Elementary is a gift to all involved. It gives our students the opportunity to mentor younger children, and build relationships outside of our school community. It is a blessing to the children at Ortega to have older children affirming them and spending one on one time with them. Our goal is for our 5th graders to build relationships with the Kindergarteners, encouraging their reading skills while encouraging our 5th grader’s writing skills. The 5th grade journal entries of their visits are used to create a story written and illustrated specifically for their Ortega partner, given at their last meeting. St. Mark’s sixth graders are given the opportunity to visit with students from The North Florida School of Special Education several times during the year. They even hold fundraisers to earn money to pay for bus transportation. Through these visits they have formed touching relationships with children who have mild to moderate disabilities. Several afternoons of fun are spent at the North Florida School for everyone to participate in P.E. classes together. Beach volleyball, soccer, obstacle courses, and parachute play are enjoyed by all! The smiles and laughter outside on the field are priceless. The students also attend art class and help each other in the classroom setting. For an introduction to how service joined with learning creates deeply relevant, real-world experiences for students, visit the National Youth Leadership Council and read project examples from elementary, middle, and high schools.